American Eagle gold coins are a popular choice with investors, but why is this? There are a variety of reasons why investors choose a specific coin type. Gold bullion coins make a great investment, and are issued by many different countries. The recent economic downturn which has had a global effect, caused many more individuals to turn to gold for investment purposes or switch their investment goals from the money market into the precious metals direction. American Buffalo gold bullion coins are also popular with American and foreign investors, but the Eagles seem to be the most favored options minted in the USA. One reason is that investors may be more comfortable with gold bullion coins issued by the United States. If you are thinking about buying American Eagles you are not alone. There are other options, such as British Sovereign gold coins, Gold Krugerrands, and others, but the Eagle coin design is the iconic symbolism associated with the United States, and allows investors to choose a patriotic option. They are a highly liquid investment choice, and can be sold to any coin dealer in the country. American Eagle gold coins are widely recognized, so any dealer will instantly realize the value of the coin you are selling. You will also regain the value of this investment, so you can get a fair price if you sell the coins. 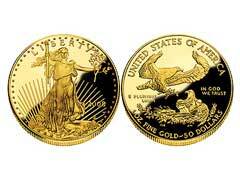 Now is a perfect time to invest in gold by buying American Eagle gold coins for many investors. Even though the prices on precious metals are very high now, many experts predict that they could continue to rise further. This is also true of the gold Maple Leaf price and other bullion coins, but the Eagle is one of the most popular and well known options. If precious metals prices continue to climb, American Eagle gold coins which are purchased now could still end up bringing you a nice profit when they are sold in the future. These coins are trusted, and that is one reason investors prefer them.